On every river you can find one place that’s so full of mystery, life, and beauty, that it’s like finding the very heart of the river itself. It may be a shadowy, swirling pool that reflects light in such a way, you could swear you were seeing into another world. Or it could be an easy bend where the rush has undercut the bank, and trees’ roots dip into the stream. They are images of every river, but something about that particular spot makes it seem different, unique, and inspired. 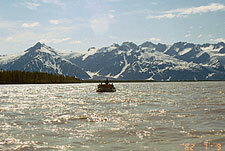 On the Alsek, you can find that place after each turn. 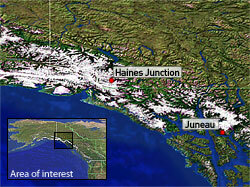 The Alsek River is not easy to find (it’s short, often not labeled on maps or in atlases) and a challenge to get to: we traveled to Juneau, Alaska, a capitol city accessible only by air and sea, and took a ferry on the Alaska Marine Highway system up the spectacularly immense Lynn Canal fjord to the panhandle fishing town of Haines. From there, we drove five hours in a school Area of interestbus into the Yukon Territory, Canada, to the Kluane National Park and Reserve town of Haines Junction; then we hiked in several hours to the banks of the Dezadeash River–near the confluence of the Kaskawulsh River–just upstream from where the Alsek begins in earnest. Here, we joined our guides, acquainted ourselves with the two-ton (loaded) inflatable oars rafts that would be our primary mode of transportation for most of the next two weeks, and set off downstream. This was the start of a wilderness so remote that once we were on the water, we wouldn’t see another group of humans for more than ten days. It’s a part of the world where there are mountains as far as the eye can see, many soaring to 10,000 feet or more, and most of them still unnamed. The same goes for the glaciers, flowing from a lake of ice in the center of the adjacent mountains that’s so vast, an entire range has been named for it (the Icefield Range), its frozen rivers coursing through the valleys and filling the Alsek with frigid water, icebergs, dirt and silt, boulders, and more, as they grind the earth beneath their creeping weight. On our hike into the launching point, we saw the first of eight bears (black and grizzly; a low number, compared to some trips, but we weren’t disappointed), as well as any number of regionally specific birds, including trumpeter swan, golden eagle, and Arctic tern. We were a group of fourteen, including three highly experienced professional guides. Ours was a private trip organized by an old friend, Mike Pratt, who had run the Alsek more than any man before him; he would be our lead guide on the river, and this would be his last commercial trip down it, before settling into married life in his home back in the contiguous United States. The gear, itinerary, and all three guides had signed on through the international adventure travel company Mountain Travel Sobek. Running the Alsek is not for the faint of heart. We were twelve days on the river, hiking and paddling and very often fighting off the dampness of 34º water; sometimes enduring a bone-chilling rain that turned to snow just up the side of the nearby mountains; sleeping in tents filled with mosquitoes “big enough to carry off grizzly bear,” I heard someone joke; not showering or bathing properly; sharing ourselves and our most intimate moments with a group of people. But it’s not bad either. There are special things on the Alsek: a herd of mountain goats that graze on the grassy slopes of a hillside named specifically for them (Goatherd Mountain); the soft fluorescence of blue ice at the core of a massive, recently calved iceberg; and of course, the ancient whispering rush of currents at the confluence of two great rivers: the Alsek and its more frequented neighbor, the Tatshenshini. In the first few days we got our bearings. We tried our hands at the oars (though our main jobs would be to paddle when the oarsman/guides needed our help, or when we needed the circulation to keep warm). We acclimated to the temperature, altitude, and environment. We got to know our tents and, in some cases, our tent mates. And we asked questions–lots of questions… Will we see many bears? What do we do if we see one up close? [Counter to many people’s understanding, our guides refer to the popular “bear bell” as a “dinner bell,” because it is more likely to attract a bear, than deter it.] How well will we eat? How often will we eat? Where will we do our “business”? What are the rapids like? What happens if we fall in the cold, cold water? How far can we roam without a companion, bear spray, knife, guide, or otherwise? Questions. Questions. Questions. Listening to us, you might think we’d never set foot outside our urban enclaves before, protected by the convenience of a McDonald’s on every corner and a Starbucks in between. In fact, for the most part, all of us had reasonable experience in the outdoors: camping, trekking, rafting–roughing it, as they say. But none except our guides had ever been to a wilderness so removed and dramatic as this. It had an immediate effect: it turned us into excited little kids, with a new question for every answer we were given. What? How? When? Where? Why? It sounds rather pesky, but on the Alsek, where danger can arise at every turn, these questions must be asked. What do you do when you’re standing face to face with a grizzly? You gently raise your arms to the sky to show that you’re not threatening, then you speak quietly to the bear, while slowly backing away in an oblique direction: “Hey bear,” you might say, “Ho bear. I don’t mean any harm. Just passing through…” And if the grizzly decides to charge, and you’re lucky enough to have bear spray at hand, then you make sure–in the split second you have to think–that you’re not downwind, when you spray that animal right between the eyes. One small can of bear spray (essentially, mace for a 1,200 pound beast–guns are strictly forbidden in the Canadian parks system) will almost always disable the animal, sending it into the woods to tend to its stinging senses. If you’re downwind and the spray blows back on you, you’ll feel the very unfortunate effects yourself. Of course, if you’re unlucky enough to be without the spray, you should drop to the ground, face down, cover the back of your neck, and let the bear maul you. Very often he or she will simply play with you before losing interest, but “playing” with an animal six times your size, with gnashing teeth and razor sharp claws means being thrashed and slashed open, severely injured, or even killed. And that’s the point: there are many opportunities to lose your life on the Alsek, if you’re not careful. That’s part of what makes it such a wilderness adventure. But danger is only one side of the equation. Depending on your method of travel–using a professional company, with guides who are also great cooks, storytellers, naturalists, and jokesters; or a self-guided trip down the river, which can be not only more dangerous (for not having at least an idea of what to expect), but also less inspiring, if you’re not totally familiar with the Alsek–for every threatening moment, there can be ten more that are comforting and even luxurious. On our third day, camping at a site we called “Sandblaster” because of its uncomfortably strong winds and barren sandy landscape that pelted us horizontally in the gusts, we were treated to an exhilarating hike up Goatherd Mountain, from the top of which we had the best vantage possible of the enormous Lowell Glacier–a frozen river of mud and ice so wide it resembles a 50-lane superhighway; then we feasted at the river’s edge on a delicious dinner of fresh grilled sockeye salmon and vegetables, with tea and hot chocolate; followed by a site I thought I’d never see in such wilderness: a makeshift–but ingeniously engineered–sauna, made from a spare tent covered with heat-trapping tarps, the steam created by dripping glacier water over three heavy steel bricks that had been buried in the fire pit for hours. Later, our night was defined by the blowing wind and the rhythmic rumble of icebergs calving into the river, and well before the rest of camp rallied, a few of us woke for a glorious view of the 3:30 A.M. sunrise over the ever-present Mounts Kennedy, Alverstone, and Hubbard, which themselves seemed to rise out of the much closer Lowell Glacier. It is the kind of picture, I think, mere words cannot describe adequately. 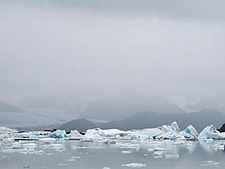 Even a photograph seems only to partially capture the environment of the Alsek. In the end, I knew, I was witnessing among the best the earth had to offer; after this trip, I thought, I would not sense the world around me in the same ordinary terms I once had. This was indicative of our experience there: work hard in the day–paddling and hiking through a spectacular environment, while finding harmony with cold rain and winds, icy river water, and sometimes frozen air–and unwind at night with a hot meal, good drinks, stories, games, and a warm sleeping bag. When we were lucky enough to find a camp with a long, flat beach, we’d set up a horseshoes pit, or play a sort of tug-of-war game called “hunker down,” which involves two opponents balancing opposite each other on ammo cans (used on river trips for easily accessible airtight containers) and trying to force each other to fall to the ground by strategically pulling and releasing the end of a rope that the players hold between them. There are several places on the Alsek where I thought the world had invented itself in the most striking and beautiful possible form. The purple sunrise on Mt. Hubbard, behind the meandering Lowell Glacier; the fresh fallen snow on a jagged nameless peak that reminded me of something from a Tolkien novel; the churning holes in the great rapid Lava North, for which we donned dry suits and an extra measure of courage to run (falling in the river there can mean certain death, if you get caught in an eddy); or the eerie silence on a foggy morning as we gathered firewood on a sandbar at the head of Alsek Lake. But despite all of these amazing natural wonders, the time my adrenaline hit its peak was not while immersed in the unadulterated landscape of the Alsek, but rather, while hurtling through the air, hundreds of feet above the seven-mile-long face of the Tweedsmuir Glacier, staring down at the boiling cauldron of rapids in the impassable Turnback Canyon, from the relative safety of a speeding helicopter. This was our portage day. Turnback Canyon is a place on the Alsek–a river known more for its pristine beauty, than its dangerous rapids–where the valley walls contract from roughly 1.5 miles wide to about 30 feet over a very short span. The boils, holes, eddies, and falls created by that dramatic change in the river’s dimensions, makes it virtually impossible to pass through and survive. In 1971, the legendary kayaker Walt Blackadar became the first to run Turnback. It was by shear luck–he said later on–that he lived to talk about it. Only having successfully paddled through the treacherous canyon did he claim it was unrunnable and he would never think of doing it again. Afterward he said, if he could have turned and gone back after the very first rapid, he absolutely would have–a humbling admission from a man who had seen, perhaps, more whitewater adventure than any other by the time he died kayaking seven years later. Since then only a handful of boats–inflatables like ours, as well as kayaks–have tried to make it through Turnback Canyon, and just a few of them have emerged safely on the other end. 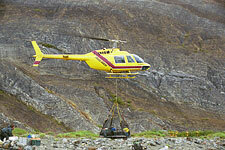 Thus, we arranged for a helicopter to meet us at the last camp before the canyon, to haul us and our gear over it. The cowboy pilot at the helm was like someone out of the movies, telling us one moment that he wasn’t allowed to dive into the canyon, and the next, doing just that at a speed so jarring and exciting that I simultaneously wanted to lose my lunch and get my pilot’s license. Once on the other side, we reassembled our gear and began the leg of our journey that traversed the lower end of the Alsek, heading toward Alsek Lake, and beyond that, the ocean. Alsek Lake was the site of our final night. But more than that, it was a culmination for me: so full of grace and beauty, awesome size and geology, wildlife, quietude, color, and light that I thought, if the entire two weeks were spent there alone, the trip would still have been amazing. The entrance into the lake began at the tail end of one of the most arduous rains we experienced. After paddling through the morning, we stopped at a beach at the head of Alsek Lake. A short walk through fields of wildflowers–blazing Indian paintbrush, fireweed, goldenrod, and more–opened up to the iceberg-laden water, still hidden in afternoon fog. Through that mist, we’d find our last camp. As we paddled across the lake, we slowly entered what might have been a completely different universe from the rain and cold of just minutes before. The clouds broke and the blue sky opened over us, light beaming onto the house-sized blocks of ice floating before us. 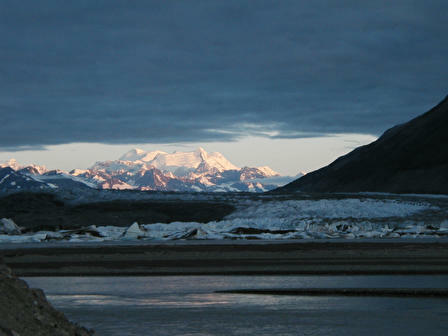 I looked around and saw, between narrow spits of land in the distance, the vast plains of three tremendous glaciers. They were the Alsek Glacier–spilling into the lake, its towering face calving huge chunks of ice; the Grand Plateau Glacier; and the sprawling Novatak Glacier. And even farther away, almost painted on the background, Mt. Fairweather rose high into the sky. 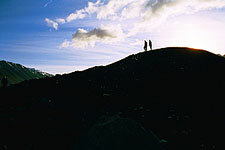 At roughly 15,300 feet, Fairweather is the region’s highest peak, and it is situated practically right next to the ocean. The name comes with a touch of irony as it can generally only be seen when the weather is clear, which is not often in those parts, but we were the lucky ones. As we tied our boats together–creating a single, wide float–and paddled among the ice, with blue evening sky overhead and a rainbow of colors reflecting off the surrounding water, I spotted the flash of a great bald eagle sweeping down the valley wall. Graceful, fast, and furious with its talons flared, the eagle slammed into the placid lake and almost immediately began to struggle under the weight of the salmon in its claws as it took flight again. It was an image I had only dreamed of up to that point. 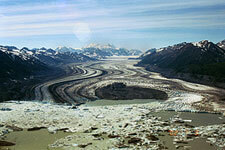 And as that dream slipped into reality, I thought, that–for me–was the true heart of the Alsek.